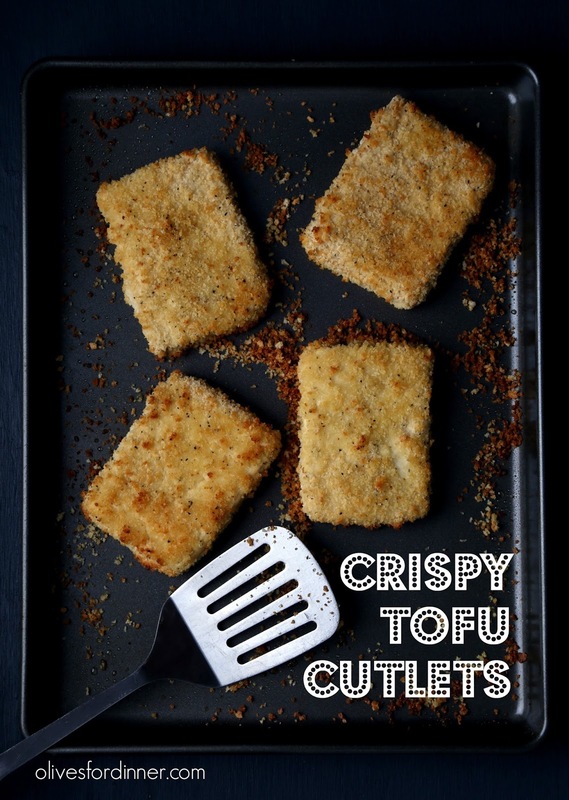 Crispy tofu cutlets are easy to make, super versatile and get along well with any carby side and warm or roasted vegetable you put next to it. This recipe is super basic and is meant to be tweaked around with as much as you like. (See a list of serving suggestions below.) All are great, but I highly suggest serving these cutlets alongside a mound of mashed potatoes and gravy—it’s easy comfort food at its best! 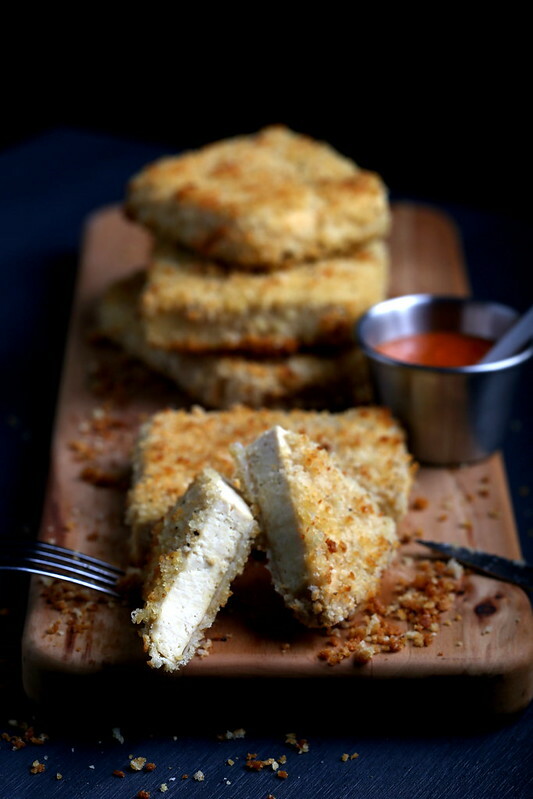 For a meatier cutlet: Prepare the tofu (super-firm is best) in advance by cutting it into 4 slabs and place into the freezer and allow to freeze completely. Thaw it. Once the tofu is thawed, press all of the moisture out of it. Then set up a glass pyrex with enough vegetable broth to cover the slabs. Refrigerate until ready to use. No need to press the tofu again before breading it. For a fishy cutlet, add 1 tsp each of dill and Old Bay seasoning to the panko mixture. Serve with vegan tartar sauce, or make your own by combining pickle relish with Vegenaise. Goes great with french fries and vegan coleslaw. For a spicy cutlet, add a few pinches of cayenne or habanero to the panko mixture. Serve with sriracha or gochujang combined with Vegenaise to taste. For an Asian-style cutlet, season the panko mixture with 1/2 tsp Chinese Five-Spice and a little extra black pepper OR mix with Chinese spicy mustard and Vegenaise to taste and serve with rice or noodles. For a Southern-style cutlet, serve with vegan BBQ sauce or gravy and a side of mashed potatoes or vegan mac and cheese. The panko mixture is really versatile and can take on any kind of spice you like, such as rubbed sage, za’atar, berbere, ras el hanout or chana masala, etc. for example. Serve with whatever sides and vegan sauces you prefer. Preheat oven to 400. Lightly mist a baking sheet or large cast iron pan with oil, set aside. Set up three wide and shallow bowls in a line in this order: Bowl one: white rice flour. Bowl two: Ener-G/water. Bowl three: panko and spices. Place one slab of tofu into the white rice flour and press until evenly coated, tapping off any extra. Next, give it a quick dunk into the Ener-G/water mixture, then transfer to the spiced panko mixture. 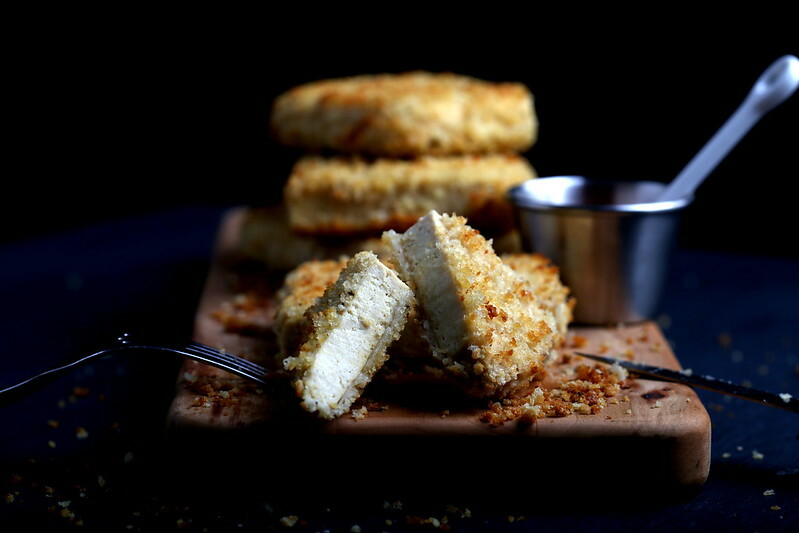 Press the tofu into the crumbs until coated, pressing panko onto any exposed areas with your fingers. Place onto the greased baking sheet or cast iron pan and repeat the process with the rest of the tofu slabs. Mist the tops well with cooking spray and place in the preheated oven (I placed mine on the top rack) for about 10 minutes, or until the bottoms are golden. Remove from the oven, flip, give the tops of the tofu as well as the bottom of the pan or sheet another solid mist of oil, then bake for 10-15 minutes more, or until golden all over. Serve immediately. Angie, it's worth a try! If you try an alternative egg replacer with success, I'd love your feedback! This is a great recipe – thank you for posting it! A question though – is the rice flour essential, or can you use all-purpose? Thank you for this amazing recipe! My three kids all loved it. I’m excited to try some of your other flavor ideas. Thanks! Made this last night adding lots of cashew parmesan to my panko. I love Asian and usually all my tofu dishes Asian on way or another so to have this delicious switch is wonderful – thank you for such a simple, quick and super delicious recipe.